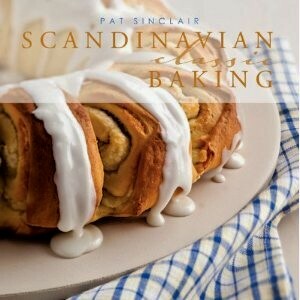 If you are a true cookbook collector, niche cookbooks, baking books, you will want to have Scandinavian Classic Baking by Pat Sinclair on your shelf, in the baking section. Sinclair, a food consultant and recipe developer, takes you to the Land of the Midnight Sun for traditional baked goods of Scandinavia that hints of cardamom, almonds, and cinnamon. Swedish Limpa, Mini Princess Cakes, to Danish Aebleskiver are just a few of the tempting baked items.